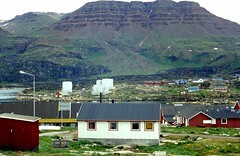 Qeqertarsuaq, or Godhavn, is a port and town in Qaasuitsup municipality, located on the south coast of Disko Island on the west coast of Greenland. Founded in 1773, the town is now home to a campus of the University of Copenhagen known as Arctic Station. In 2013, the town had 845 inhabitants.